Opening: September 12, 2012 at 8pm, with Apertura 2012 (ArteMadrid). 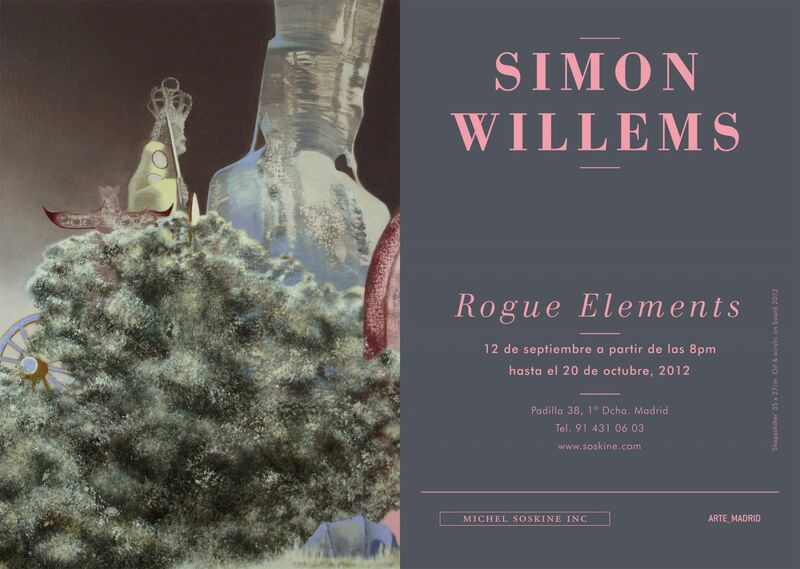 Michel Soskine presents in his gallery the first solo exhibition show in Spain of the english artist Simon Willems, (Shoreham-by-sea, UK,1971). The exhibition features 25 small size paintings from the past 12 years, including work from the projects All Things for all People and A Certain Way to Fade. The work that features in this show relates to a number of narrative strands and details that run consistently through the work of Simon Willems. At a formative level Willems is interested in images and ideas that confuse mental and physical realities. Politically and socially aware, Willems focuses on the issue of societal withdrawal and our voyeuristic consumption of the spectacle. His painting are metanarratives that show strange gardens, other-worldly lanscapes, worrying animals; they are works full of figures, bodies and landscapes that seem to be constantly in process of dissolving. Willems’ thinking centres on the recognition of incongruous contexts and narratives that refer to specific places and people, where the placement and location of memory and its erasure have been central. Fascinated with reflecting surfaces, we find many bubbles in his work than reveal hidden worlds: however we cannot sit back on our first impressions, because the meaning in the work is open to many interpretation as differing sensibilities. For Willems this project was conceived in response to the unexpected discovery of the Mandarom, as viewed through a set of binoculars from a pedalo in Provence, France, whilst on holiday. The Mandarom is a cult representing all religions. The organisation was founded as the ‘Aumist’ religion in 1969 in the holy city of Shambhasalem by its founding leader, Gilbert Bourdin. Bourdin went on to build a number of temples, statues and shrines to various faiths, at the centre of which sat a 33 metre high representation of himself, as the self-proclaimed cosmo-planetary messiah. For Willems the Mandarom narrative appealed on many levels, not least in the absurd irony of witnessing a remote sect displaying ‘neverland’ exhibitionism from the heart of a national park. Beyond its anecdotal charm and incongruous location, the project opened up questions of narrative licence in both the French government, who went on to demolish the 33 metre high statue of Boudin over the illegitimacy of its building permit, and the sect itself. Willems discovered that the community gave tours twice-weekly during the summer months to raise funds. The grey and pastelised works in this project are small in scale, proposing and intimacy in contrast with the gargantuan sculptures the reflect. Part of a broader project about hermits, as a lens through which to foreground personalised utopias, A certain way to fade was conceived in response to the story of Manfred Gnädinger. Originally a native German, Gnädinger migrated to the small fishing village of Cammelle in Northern Spain in the late sixties. It is said he went mad there after becoming sensitised to ecological issues, he built himself a small hut on the beach where he spent the next forty years. He quickly became a local curiosity, referred to in Galician as “O Alemán” (the german) and then just “Man”. During this period he built an extensive oeuvre of beach-derived sculpture and artworks, as a museum within the organic garden he created and ate from. Working alone with nature, Gnädinger’s world was crushed when the Prestige Oil spill of 2002 blighted the northern Spanish coastline, destroying most of his garden and its contents. Soon afterwards he was found dead in his self-made home. Willems’ interest in “Man” is not solely in Gnädinger's choice to live this way but more critically in how he was championed as a symbol of the oil-spill tragedy, exacerbating his local fame to a point of overwhelming media intrusion that subsequently affected his mental health and eventual death. Tourist detritus and other details present a similar logic as a ubiquitous metaphor of wholesale consumption: the abandoned baseball cap, the half-eaten fast food and the menacing presence of the seagull parasite. Simon Willems graduated from the Royal College of Art in 2000 and has exhibited widely in galleries and museums in both Europe and North America. Public collections amongst others The Zabludowicz Collection, The Leonard Nimoy Collection, Art Review, David Roberts Collection, Fondation COLAS, FRAC Auvergne, FRAC Haute-Normandie, Artotéque De Caen, Royal College of Art and the Frederick Weisman Foundation.